Let's face it, plants promote a healthy lifestyle. Add a little flair to your indoor décor with a stylish curved glass terrarium. Providing Premium Quality Since 1997 H Potter is a family owned business that takes extreme pride in creating distinctive home and garden accents. We've spent the last 20 plus years designing and manufacturing indoor and outdoor décor products for your home and garden with over 100 designs including terrariums, lanterns, trellises, window boxes, planters, torches, and bird feeders. Many of our signature items are 100% handmade by artisans to ensure a top-notch product. We put significant resources into the design, quality, function, and look of each H Potter item, using only quality materials including stainless steel, hand-blown glass, and dramatic copper. We don't cut corners to save money-we believe our customers deserve only the best. HANDCRAFTED REAL CURVED GLASS - METAL BASE WITH POWDER COAT FINISH - Glass house sits atop a gray powder-coated metal tray which rests on elegant ball feet for luxurious appeal. This geometric planter box is modern with a timeless feel. Complete with custom, functional plastic liner and professionally printed planting brochure, this home décor accent is designed to add character to your living space. If ordering an H Potter planting kit choose a Small Size Kit. HOME DÉCOR ACCENT FOR ALL SEASONS - Approximately 9.5 inches long by 5.75 inches wide by 13 inches high, the metal planting tray itself is 2 inches deep. This Wardian Case will make an eye-catching focal point and impressive statement wherever it's placed. Sold as a single glass box planter, it's beautiful displayed as centerpieces or multiples lining your dining table. 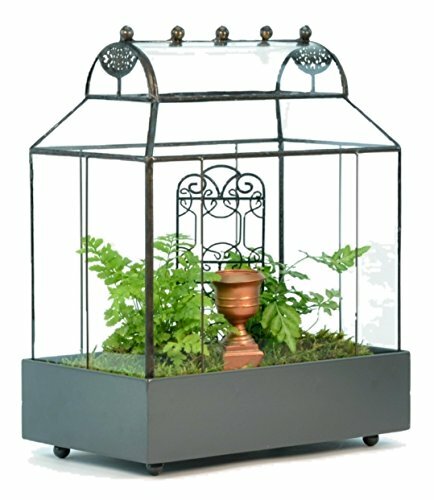 Unique and sturdy, this beautiful terrarium planter would make a perfect wedding decoration or birthday gift idea. QUALITY BY H POTTER - H Potter has been designing and manufacturing premium quality garden products for over 20 years. We do not pretend to be the cheapest, but you get what you pay for. Packaged well, with stunning craftsmanship and backed by great customer service, we're proud to say our garden products are built to last. Moss, props and plants not included, terrarium only. HEAVY AND DURABLE CONSTRUCTION - Built to last, use with any seasonal décor. Glass is 3 mm thick and solder is lead-free to protect you and the environment. Stunning filled with any plants from miniature orchids to ivies. Easy to update and freshen your holiday decor. Simple enough to blend with any home décor. Trending now, terrariums add earthy warmth to your traditional or modern home. INTRICATE DETAILING - MINIMALIST STYLE - Plants not only promote a healthy home environment but can offer a touch of elegant beauty to your home. Uniquely designed with a heavy, durable construction, create a miniature fairy garden. Tranquility of greenery is an ideal mood setter and stress reliever, this gardening planter is the perfect size to fit any location and can be moved easily. Use indoors on any tabletop to connect with the outdoors.